IT MUST be obvious to everyone that State Government water policy is an incoherent mess. Continuing to allow logging in what remains of our forests has led to progressive drying out of the moisture-retaining regions in the wet forests. Our water catchments are drying out, which also makes them more vulnerable to fire. Rejecting solutions such as subsidising tanks and recycling waste water looks like plain stupidity but may be no more than pandering to electoral fears of contamination. Stealing (Goulburn) water from the Murray when that river is on the verge of collapse is irrational and wilfully irresponsible. Privatisation of our water delivery systems leads us further down a dangerous path towards lack of control over our most fundamental resource. None of the Government's initiatives take appropriate account of the over-arching problem of climate change. Panicked by continuing drought, ministers have tried to take "strong" action to show they are "doing something". Unfortunately, conflicting responsibilities between unco-ordinated bureaucracies, dominant unions and private lobby groups all reveal deficiencies in the Government's approach. In the end, it is lawyers who are left to argue over the allocation of costs for failed systems. This Government may not like taking responsibility for the wellbeing of its citizens but that is what it was elected to do. WE WILL know the world is truly past the climate-change tipping point when we stop seeing letters from foresters claiming that their regrowth plantations are better carbon sinks than mountain ash forests (Letters, 23/6). Also disappearing at that point will probably be their argument that old-growth forests need harvesting to save them from becoming merely ash, despite their obviously superior fire survival rates. The last survivors will probably be ministers for forests, tucked safely down the deep pockets of the industry's lobbyists. Letter to the editor, The Age, 23 June 2009. GAVAN McFadzean (Comment, 22/6) rightly points out that the old-growth mountain ash forests of the Central Highlands are important carbon stores. These are also relatively rare as much of this forest was killed during the 1939 fires. The old-growth forests remaining after 1939 were predominantly in Melbourne's water supply catchments. Unfortunately, they are far from fire resistant and many magnificent stands, including the state's top 10 tallest trees in the Wallaby Creek and O'Shannassy catchments, were killed in the February fires. The small portion of the mountain ash forests that are harvested for timber production have, almost exclusively, originated from the wildfires of 1939. These regrowth forests form the basis of the Victorian hardwood sawmilling industry. Logs from the Central Highlands that are not suitable for sawing are predominantly used for paper production, creating value-added products and sustainable jobs in regional Victoria. Sustainable timber production is greenhouse friendly, with harvested forests being regrown and becoming carbon sinks. As the trees grow they continue to take up carbon dioxide from the atmosphere — at a greater rate than old-growth forests. SO WHERE are the world's most carbon-rich forests? Not the tropical rainforests of the Amazon, Borneo or Africa's Congo Basin, according to research by the Australian National University. They are the tall, old-growth mountain ash forests of Victoria's Central Highlands — a 90-minute drive east of Melbourne. The researchers studied 132 forests from around the world to discover the regions that stored the most carbon. Their findings, published in the US-based Proceedings of the National Academy of Sciences, one of the world's most-cited scientific serials, is a surprise because conventional wisdom says that tropical forests store the most carbon. So why our forests? The conditions are perfect. These forests occur at a confluence of environmental conditions that lead to high rates of plant growth and, because they are cooler, decay rates are slower. In short they grow fast but decay slowly. And they are very old — at least 350 years, growing dense heavy wood. That's important because the amount of carbon stored is due to volume and density. Also, these trees have not been subjected to logging. The problem is, these very same forest types are being intensively logged for woodchips, mostly bound for Japan. These trees are not only the best at producing carbon; unfortunately for them, they are also some of the best for producing high-quality paper. To add insult to injury, several of Melbourne's water catchments are among those logged. ANU science shows that for as long as these forests are logged, their carbon-carrying capacity is reduced by up to 60 per cent, not to mention the emissions from logging and post-logging regeneration burns. If we stopped logging all the forests of south-eastern Australia, and we now have enough wood in plantations to do that, we would avoid emissions equal to 24 per cent of the 2005 Australian net greenhouse gas emissions across all sectors. Ironically, the plantation-based timber industry is under great economic stress, with several major wood plantation growers in receivership. This is the right time for Premier John Brumby to develop an integrated industry rescue and climate package, which creates green jobs in the plantation sector and focuses management of our native forests on emissions reduction. Another reason why these forests are so carbon dense is because they evolved with fire. Yes, the Black Saturday fires did pass through some of these forests, but most of the carbon remains in the forest. This is because it is in big old trees and dead trunks, and in the soil. Therefore, the proportion of total carbon lost in the fire is surprisingly small compared with logging. Also, many trees survive fire in less intensely burnt patches, facilitating regeneration. But logging these forests makes them more vulnerable to fire because it fragments and dries out the landscape, replacing fire-resistant tall forests and a wet rainforest understorey with young eucalypts and a much drier understorey. This research (combined with research released by ANU last year) demonstrates how important it is for the Federal Government to assess how much carbon could be stored in Australia's native forests, how much greenhouse gas could be prevented from entering the atmosphere if we protect them from logging, and what their long-term ability to keep on pulling carbon dioxide out of the atmosphere actually is. It also suggests that there is a serious new option to reduce our greenhouse gas emissions. The Federal Government has made provision for complementary measures to be developed to supplement the carbon pollution reduction scheme. Clearly there is scope to develop a package to reduce emissions and protect and restore the carbon stored in our native forests. Such a package could prevent millions of tonnes of carbon dioxide being released. We need to start recognising the value of these forests to climate change mitigation. The Government should provide incentives so that state governments and private land owners are rewarded for protecting and restoring the carbon stocks found in natural forests under their control. Everyone is concerned with emissions from logging and tree clearing in developing countries, but the Government needs to ensure that the Copenhagen agreement also provides policies that give incentives to protect and restore carbon stocks in developed nations. We knew these forests should be protected because they are our water catchments and habitat for endangered species such as the Leadbeater's Possum, Victoria's faunal emblem. Now it turns out they are the world's largest carbon banks and their protection should be a critical part of any response to climate change by Prime Minister Kevin Rudd and Premier John Brumby. Will the public interest finally take precedence over that of the woodchippers? Surely these forests have put an irrefutable case for their protection. Gavan McFadzean is the Wilderness Society Victorian campaigns manager. LETTER: Would you credit it? IT'S good to know that Victoria's mountain ash forests are the best in the world for storing carbon. Does that mean that, sometime in the future, some industrial polluter will gain carbon credits for not chopping them down? ISN'T it time evidence-based policy-making finally found its day in the Victorian Government and someone took note of our own scientists ("Mountain ash best for carbon", The Age, 16/6)? The ANU is telling the world we have the best forests in the world for storing carbon, so why the heck are we chopping them down? Australia has been asking its neighbours to stop logging their "precious" forests"; well, let's get our own backyard in order before we rain down on those over the fence. Seriously, we must be able to find alternative jobs among the mature plantations across Victoria to support the small groups that continue to log these essential ecosystems. Everyone is entitled to a job but our drinking water supply, habitat for so many rare native animals and this vital system to reduce the causes of climate change are worth more than their small timber value. John Brumby, bump up your climate policy and get these forests off the loggers' radar. The world's most carbon-dense forests are not in the tropics, but in a protected mountain catchment that supplies Melbourne's drinking water, new research shows. A five-year study by the Australian National University of more than 130 forest sites around the world found these wet mountain ash forests just over an hour's drive from the Melbourne Cricket Ground store twice the amount of carbon as a tropical rainforest. The cool, moist temperate forests of the O'Shannassy catchment, which includes the headwaters of the Yarra River, store just under 2000 tonnes of carbon a hectare in their giant 300-year-old mountain ash eucalypts, lush understorey vegetation such as tree ferns, and in dead wood on the forest floor. But as the trees age, the figure rises, with trees more than 250 years old boosting the carbon sink capacity to just over 2800t a hectare. The unexpected findings, published online today in a National Academy of Sciences journal in the United States, have critical implications for climate policy in the lead-up to the United Nations climate conference to be held in Copenhagen later this year. The research paper, by ANU ecologists Heather Keith, Professor Brendan Mackey and Professor David Lindenmayer, over-turns conventional theories on the role of forests in carbon accounting. Professor Mackey said, ''It identifies a gap in climate change policy that Australia needs to address. ''There has been a lot of talk about the need to address tropical deforestation in developing countries, but these results show we must start by recognising the carbon benefits to be gained from protecting our native forests,'' he said." There are renewed calls to stop logging in old growth forests after new research found they could be the most valuable source of carbon in the world. Scientists at the Australian National University studied 132 forests around the globe and the surprising results show a forest in central Victoria was the most carbon dense of all. It has been widely believed that rainforests around the world are the most effective at storing carbon. But now scientists are questioning that belief after research has shown mountain ash forests in central Victoria hold the most carbon. The study shows the Victorian forests hold 1,900 tonnes of carbon per hectare, which is up to four times higher than what is found in tropical forests. Brendan Mackey, a professor of environment science at the Australian National University, says it is an important find. "The trees in these forests can grow to a very old age - at least 350 years - and they can grow very large, very tall, and they grow very dense, heavy wood," he said. "Most of the biomass carbon is in big, old trees, and these are large, old, dense trees. These particular stands have not been subject to intensive land use, such as logging, so ... they've been able to grow and reach their natural carbon-carrying capacity. "And finally, it also reflects the way these forests have evolved and adapted in response to fire." Some other scientists now say this is proof that logging should be stopped in mountain ash forests in Victoria. Dr James Watson, from the University of Queensland, says this level of carbon is so significant that it could be a real help in fighting climate change. "We know that logging actually really does impact the amount of carbon in a forest," he said. "These forests are incredibly carbon dense. We're talking about 18 tonnes of carbon in a hectare of forest, which is extraordinary. When we log this forest, we lose up to two-thirds of the carbon." Around 9,000 hectares of forests are logged in Victoria each year. Dr Watson says given their significant carbon capacity, they should remain untouched. But the National Association of Forest Industries chief executive, Allan Hansard, says logging is a tool in total forest management. "One of the things that does come with the changing climate is the increasing risk of bushfires," he said. "So if we have an approach where we lock up and leave these forests, what we're actually doing is increasing the risk that these forests will burn down. "Now, this is important from a climate change perspective, because if you actually have a look at the amount of emissions that come from these fires, it's quite substantial." Professor Mackey says the Federal Government needs to provide incentives to stop logging in these forests. "Up until now we really haven't thought about the carbon value of these natural forests," he said. "People have thought about their timber value, other people have thought about their habitat value for wildlife, but no-one has really given much attention to their carbon value." "This is a real surprise ... instead its forests in the temperate region that have the most," Prof Mackey said. The research is published this week in the US-based Proceedings of the National Academy of Sciences." The continuation of old-growth forest logging after the State Government's commitment to protect them is a worrying failure of government. It is incredible that cow paddocks may be protected when 500-year-old forest giants such as those in Brown Mountain and Delegate forests are still being killed, mainly for woodchips that nobody now wants to buy. These forests contain many threatened species such as owls, gliders, quolls and even crayfish. They also provide valuable water for our river systems and communities. These forests can also provide green jobs for local communities into the future through ecotourism that would attract thousands of local and international visitors. The time has come for the Brumby Government to protect them immediately. IT'S time we sent VicForests and the State Government to the knacker's yard for this lunacy of fobbed-off promises to protect the precious forests of Victoria, and delivering us only a handful of hay. Someone needs to remind VicForests of the definition of "old growth" and how essential these forests are to curbing climate change and supplying Victoria and Australia with drinking and irrigation water. Its commitment is a joke, its motives extremely questionable and, with antics like this, my trust in my Government is running thin. Premier John Brumby, please prove your leadership and honour your Government's promise to immediately protect the real old-growth forests of Victoria. So, Lyall Johnson, we need more surveying to ensure that mapping boundaries protects the "greatest amount of old-growth forest available, while also protecting timber jobs". Then why is the Government continuing to allow logging in contentious areas, knowing that the maps upon which it relies, and which VicForests exploits (undue influence or not), are faulty? Given that such "logging" employs approximately six chaps on bulldozers and one bloke with a match for a few weeks, what jobs are actually being protected by prevaricating? Perhaps it's time for all sides to remember that governing is meant to be done for the benefit of the people — not for the benefit of companies, in the hope that they will pass on some of this benefit to the people in the form of jobs. We need an end to the false dichotomies of economy versus environment. We need a recognition that people do need to eat, but that they also need to breathe. We need the courage to ask not "how can we best protect jobs/trees/football?" but to ask "what do we need to do to ensure that we leave the world a better place, given what we know?". If that means restructuring society or providing free retraining and income support for miners, wilderness society workers or anyone else, then bring it on. Cutting down 500-year-old trees and selling them to Japan as woodchips is a bit like bulldozing superb, intact medieval castles and crushing their stones to make roads. A bit like, but actually much worse, because destroying these ancient forests kills entire ecosystems, driving threatened species closer to extinction. Yet this is exactly what our State Government is allowing to happen, despite having promised in 2006 to protect our old-growth forests. Your article ("Declared forests turn out to be paddocks", The Age, 25/5) raises interesting questions about how an iconic wilderness of forest giants like Brown Mountain in East Gippsland can be annihilated while areas of regrowth and "cow paddocks" can be earmarked for protection. It does not take a hardened cynic to wonder whether these areas are selected more on the basis of their usefulness or otherwise to the timber industry than on their conservation value. Nearly 40 per cent of old-growth forest earmarked for protection by the State Government since the 2006 election has been found instead to be young regrowth, poor quality vegetation and cleared paddocks. A survey by green groups found that about 15,000 hectares of Gippsland forest that the Government planned to turn into national park and conservation reserves was of no value to the timber industry and had comparatively little environmental value. The survey findings come as the Government engages in a protracted haggling exercise with conservationists and state-owned commercial logging agency VicForests over the final location of the protection areas. A report to be released today claims the Government is "protecting" cleared and previously logged land, while allowing timber harvesting to continue in high-value old-growth forest areas, such as Brown Mountain in far east Gippsland. This is despite its 2006 election promise to "immediately protect the remaining significant stands of old-growth forest in Victoria". Victorian National Parks Association executive director Matt Ruchel said the Government's commitment to turn 41,000 hectares into national park and conservation reserves could be an important step, but that the maps it released before the election were based on flawed ecological advice. The report, designed to pressure the Government to rethink its old-growth protection maps, says 10 of the 25 proposed protection areas in east Gippsland are not old growth forests. An area cited in the report is at Mt Stewart, which was found to be "grassy dry and shrubby dry forest, including a large weed-infested cleared field, large areas that were prescribed burned in the 1990s and 2007". Similarly, areas at Breakfast Creek, Boggy Creek and Yellow Waterholes are described as "largely burned areas from the 1980s, cleared land and logging coupe from 2006". Mr Ruchel said it was unclear if the mapping errors were deliberate or a mistake. But Wilderness Society forest campaigner Luke Chamberlain accused VicForests and "Government logging bureaucrats" of undermining the election pledge. "Two and a half years on from the election John Brumby must show leadership and honour his Government's commitment." John Hermans, a forest ecologist who runs his own sawmill at Clifton Creek, said he believed the timber industry recommended forest that was not commercially viable for inclusion in state reserves. "If more people knew what was happening here in Gippsland there is no way they would get away with it," he said. The Government promised to protect 33,500 hectares of old growth plus 5000 hectares that link the Snowy River to Errinundra National Park and 2500 hectares of "icon sites" — mainly logged areas that were once battlegrounds between conservationists and the timber industry. The protection areas are yet to be formalised in legislation, but have been off-limits to loggers since the election. The State Government did not respond directly to the claims in the green groups' report, which was also backed by the Australian Conservation Foundation. Instead, a government spokesman said that finalising the park boundaries was still a work in progress. "This process requires extensive survey and mapping work to ensure that, in line with election promises, the boundaries protect the greatest amount of old-growth forest available, while also protecting timber jobs," spokesman Lyall Johnson said. VicForests spokesman Cameron McDonald said the agency was just one of several bodies talking to the Government about the old-growth protection maps. "Any suggestion that we exert undue influence is incorrect," he said. Conflict over the protection areas has been heightened by summer logging at Brown Mountain, which green groups say is home to trees up to 500 years old. One coupe was felled and the remains burned, but further harvesting has been on hold since January, when conservationists claimed they had found threatened glider, owl and crayfish species. This triggered a State Government investigation, which Mr Johnson said found no evidence of threatened species. But he said the moratorium on harvesting in the remaining Brown Mountain coupes scheduled for logging would continue while the survey results were considered for "further issues"." After mature forest has been clearfelled, net carbon loss from the operation is large. Every now and then, a sharply focused image of a gum seedling or a finely crafted piece of furniture appears on my television screen, a reminder of how good it is to live in this place, at this time. No one pays good advertising money just to show us nice images of life in Australia. In this case, the message is how lucky we are to have a timber industry, because when it comes to greenhouse emissions, wood is so much better than other materials, such as steel or aluminium. That message was underscored on local TV news recently when Forestry Tasmania corporate relations manager Ken Jeffries, responding to complaints about smoke haze from forest operations, pointed to the industry's re-seeding program as evidence of its climate-friendly status. It is true, as the forest industry says, that steel and aluminium are anything but climate-friendly products. A steel furnace consumes copious amounts of coal, and aluminium smelting uses so much electricity (usually coal-fired) it has sometimes been called "congealed electricity". And it is true that the 1997 Kyoto accord allowed special dispensation for forestry as practised here. But it is disingenuous to claim that today's forest industry presents a sharp contrast to these alternative products; to suggest that because trees absorb carbon dioxide, the industry actually reduces our carbon footprint. That may accord with diplomatic definitions, but we have to get real here. Human carbon pollution is a physical phenomenon, independent of any political or commercial agenda, and Tasmanian forestry emissions must never be quarantined from a comprehensive carbon accounting process. I would happily accept the assurances of Mr Jeffries or anyone in the industry, if I could find the scientific evidence behind them, but try as I might, I can't. I was well into my climate change work when I entered the debate about forest and climate in this column about a year ago. I drew attention then to what forest science seemed to be telling us about how forests store carbon and what happens to this carbon when the forest is harvested. I have consulted a wide range of forest science research work, including work done by Forestry Tasmania itself about a decade ago. The science has consistently said that under today's "slash and burn" clearfelling regimes, harvesting native forest in Australia is an emissions-intensive activity. harvesting cycle. Full recovery could take centuries. SCIENTIFIC studies of forest carbon in Australia and North America have consistently indicated that, of the carbon removed from a forest as a result of clearfell operations (either taken away in logs or lost to the atmosphere in burning or decay), only a tiny proportion is preserved long-term (over 75 years) in a product such as furniture or housing. Statistics from the Australian Bureau of Agricultural and Resource Economics tell us that in 2008 only 13.4 per cent of harvested "roundwood" (itself only part of the forest carbon that is removed during harvesting) ended up as sawn timber, of which only part is retained in long-term product. My reading of the science and the ABARE statistics indicates that for every tonne of forest carbon that is saved in long-term product, there is a loss of more than 40 tonnes to the atmosphere as carbon dioxide. At this rate, Australian forestry as it is practised today is anything, but a greenhouse-friendly activity. Yet, despite all the contrary scientific evidence -- including evidence from within Tasmanian forestry circles -- the industry continues to cite Australian government figures based on the Kyoto agreement to "prove" that it is carbon-neutral, leading the way to a greener future. If the forestry industry sincerely believed this, wouldn't it secure solid evidence by means of rigorous, peer-reviewed science? Surely it would put aside the politically convenient, but illogical, accounting framework of the Kyoto accord and seek a more rational, transparent method of determining our real forestry footprint. It won't serve anyone if we continue this politically-driven charade. We urgently need to review our greenhouse gas accounting in the AFOLU sector (diplomatic-speak for agriculture, forestry and land use), incorporating existing carbon storage as well as annual flows. When our forest carbon accounting is based on science and physical reality instead of politics, we can confidently include forestry in a comprehensive national or international carbon regime. Then, and only then, will we know the real cost of a piece of timber. Peter Boyer is a Hobart-based science writer and a presenter for Al Gore's Climate Project. THE Thomson dam drops lower (The Age, 15/4), catchments have been burnt and still the logging machinery rolls into Victoria's last remaining healthy water catchment to woodchip them for as little as $8.50 a tonne. Roads for logging machinery are being cut into Cement Creek Catchment, one of the Yarra tributaries and part of Melbourne's water supply. In the Thomson catchment, about 70 per cent of the area of highest rainfall is being logged, and the dam has reached epic lows: could there be a link? In 2004 the Government commissioned a four-year investigation and found that the best option for improving catchment water yields was to end all logging by 2009. But this option was omitted from the range of choices presented to the Government because it compromised woodchip arrangements with the now Japanese-owned paper giant Australian Paper. What will it take to end such barbaric management of our water resources? Perhaps only when the last load of logs enters the pulp mill. Then we will know we cannot drink woodchips. PREDICTABLY, the Victorian Government's consideration of wood-based bioenergy production (The Age, 9/4) generated howls of protest based on inaccurate or ill-informed claims (Letters, 10-11/4). Fears of "massive deforestation" and "ecological wastelands" are baseless given that regenerating harvested areas is a central tenet of forest management. 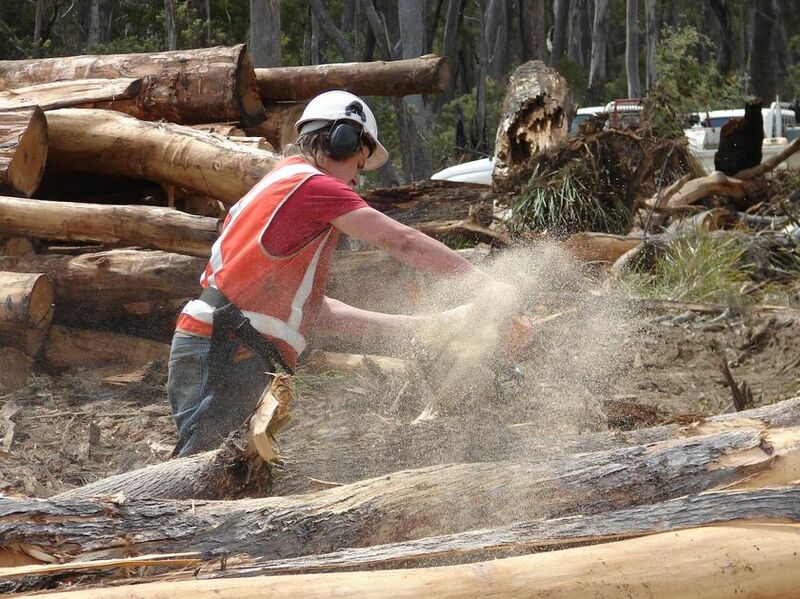 Less than 10 per cent of Victoria's forests are legally available for timber harvesting. Salvaging of burnt timber is also restricted to these areas. Aside from periodically available fire salvage material, the vast majority of waste wood that could be used for domestic bio-energy production is material that would otherwise be exported to offshore paper manufacturers. Around the world, sustainable timber supplies are widely used as a source of carbon-neutral "green" power. Ironically, in Australia, the most passionate advocates of combating climate change tend to be the most strident opponents of one of the more achievable forms of renewable energy. Recently, the radio carbon dating of a 10-metre diameter, freshly cut tree stump in East Gippsland showed it to be almost 600 years old. Last week's story of the Brumby Government selling off these ancient forests for as little as $2.50 a tonne compounds the crime into enormous proportions. In 2009, we are still watching while the Government destroys ancient forests that were young in the days of Joan of Ark. These are immense carbon stores that we need right now, not in another 600 years. Economically and environmentally, this is an appalling act. So much for the claim of sustainability. The rain follows the trees Mr Brumby, as sure as public revolt follows the clearfelling of our public forests. "LOWER-quality" logs: they are the ones with the notches and holes, the ones that wildlife call "high-quality" housing. The bushfires have already left lots of critters homeless. And now we are going to burn their last few homes for electricity? Fire is naturally occurring, logging is not. Native forests are not a renewable resource if we interfere by salvaging what's left. They are ecosystems that can take hundreds of years to regenerate. There is nothing clean, green or smart about burning them. MR DALIDAKIS' statement that the native timber industry is "focused on producing sawlogs" is wrong. When woodchipping began in the 1960s, it was justified on the basis that only "waste wood" from saw-logging would be used. However, woodchipping soon became the main focus. As demand for woodchips falls, the "waste wood" argument is being used to justify burning native forests for electricity. Perversely, due to concern about greenhouse gas emissions from fossil fuels, the native timber sector could get to emit even more greenhouse emissions and receive a renewable energy subsidy funded by the taxpayer. Because of community opposition to burning native forest for electricity, the governments of Victoria, NSW and Queensland prohibited it. It is hoped that lobbying by the native timber industry won't weaken the Victorian Government's resolve to stand by a promise it made to the people who elected them. JOE HELPER'S plan (The Age, 9/4) to burn native forest for electricity shows how out of touch he is. The vast majority of Australians want to keep our remaining ancient forests standing. This dark-ages technology, raised as a means of propping up our unsustainable logging industry, fails to acknowledge the downsides — massive deforestation and habitat destruction, loss of vital carbon storehouses, degradation of our water purifiers and transformation of beautiful forests into ecological wastelands. The claims that only the "byproducts of sawlog harvesting" will be used are misleading because, as shown by Vicforests' own figures, barely 2 per cent of what is clear-felled ends up as a high-value product. Most, including sawlog-quality wood, is trucked to woodchip mills to end up either as paper or shipped off to Japan. A far better approach would be to move logging workers into our extensive plantation estate and support real renewable energy projects such as huge solar thermal facilities and geothermal and wind plants. IN JUSTIFYING the proposal to log native forests to save the forestry industry (The Age, 9/4), Philip Dalidakis continues to promote discredited myths. For years the Victorian Association of Forest Industries has been in denial about the softwood plantation industry and the decline in real value of commodity woodchips of about 2 per cent a year. Further, they claim they focus on native forest sawlog production for high-value timber products but these are only a tiny fraction of total timber harvested from softwood and hardwood plantations combined with native forest harvesting. The real opportunity for employment is in the plantation sector, a sector undermined constantly by policies that price native forests so low to try to compete in the commodity export woodchip market. The real value in native forests is in the water yield, which is reduced for decades following native forest clear-felling. Low water yields severely affect water supplies and Victoria's rivers. AUSTRALIAN-backed proposals to reward companies that stop deforestation in poor countries will derail efforts to tackle climate climate, according to a report. Released overnight at United Nations climate talks in Germany by Greenpeace International, the report says plans to recognise forest protection in a global climate deal would trigger a collapse in the carbon permit price of up to 75 per cent. It found issuing forestry credits for avoiding deforestation would also drastically reduce investment in clean energy technology, locking in "dirty" technologies such as coal-fired power. The report comes as climate bureaucrats meeting in Bonn consider proposals on how to reduce the 20 per cent of annual global emissions caused by deforestation and forest degradation in developing countries. In a speech in New York last week, Climate Change Minister Penny Wong said she supported a global forestation credit program, suggesting it could cut the cost of reducing greenhouse emissions by up to 25 per cent. Greenpeace campaigner Paul Winn said the introduction of forest credits would encourage rich nations to buy cheap offsets overseas instead of reducing emissions from energy at home. "(Senator) Wong seems to think Australia can keep polluting and push the burden of its emissions reduction responsibilities on to developing countries and their forests," he said. He called for forests to be excluded from carbon markets, backing the creation of a fund to stop deforestation and protect biodiversity. The Greenpeace report was released at the year's first major meeting of climate bureaucrats. The Bonn meeting plans to lay the foundations for a post-2012 climate agreement, due to be signed in Denmark in December. Beyond forestry, it will consider emission reduction targets and how to find the billions of dollars needed to cut emissions in the developing world. US climate envoy Todd Stern won sustained applause on the summit's first day after promising that the Obama Administration would take a markedly different approach to that of the Bush administration, which opposed the Kyoto Protocol. "We want to make up for lost time," he said. Mr Stern said the US recognised its "unique responsibility … as the largest historic emitter of greenhouse gases". He praised China, now the world's largest emitter, for its efforts to rein in carbon emissions, but said developing economies must join with rich nations to tackle climate change. "America itself cannot provide the solution, but there is no solution without America." He urged delegates to adopt a long-range plan. Mr Obama has pledged to introduce policies that will return emissions to 1990 levels by 2020, and cut them by 80 per cent by 2050. UN climate chief Yvo de Boer urged delegates to heed the call of the millions who switched off lights for Earth Hour. One of Victoria's most prized but controversial cool temperate rainforest sites is being clear felled by loggers after the State Government reneged on a deal to protect it. Logging started in College Creek catchment in the Strzelecki Ranges six days after the Black Saturday fires devastated vast tracts on the hills that rise at the southern end of the Latrobe Valley. College Creek was one of five environmentally significant core areas declared off limits to logging by then environment minister John Thwaites in 2006. It was to have been given to the people of Victoria. The core sites were to be linked by protected wildlife corridors joining the Strzeleckis' Tarra-Bulga National Park in the east to the Gunyah Gunyah Reserve, home of Australia's biggest tree by girth, at its western tip. But last year Mr Thwaites' successor, Gavin Jennings, jettisoned the "cores and links" agreement and signed a new deal allowing Hancock Victorian Plantations to log College Creek and other areas that had been set aside. Environmentalists have accused Mr Jennings of caving in to the logger, which has commercial contracts to supply timber to the Maryvale pulp and paper mill. Now 1500 hectares within the "cores and links" will be clear felled, with the 350-hectare College Creek site the first to go. Friends of Gippsland Bush secretary Susie Zent said the site was the most politically contentious forested area in the state. "We have fought so hard to have this area saved only to have it signed away in a secret deal made against all rainforest ecologists' advice." College Creek is Crown Land over which Hancock holds a 60-year lease. With the lifting of the moratorium on logging, Hancock is now logging the site before it is replanted and returned to the stewardship of the state. Unlike higher-profile state forests and national parks in the Alpine region, the Grampians and the Otways, the Strzelecki Ranges are a hodgepodge of native vegetation, remnant old growth forest, regrowth, reserves, blue gum and pine plantations, freehold and Crown land. Their chequered history of compromise and trade-off, cultivation and preservation, exploitation and sanctuary has been dictated for 60 years by the needs of the timber industry and Maryvale mill at Morwell. Hancock is contracted to supply the mill and insists logging College Creek was necessary to meet its commitments. But community groups and environmentalists have condemned the logging and accuse the Government of caving in to Hancock. The 2006 agreement negotiated between Mr Thwaites, Hancock, Australian Paper (then owner of Maryvale mill), Trust for Nature, three local councils and community groups expired in 2008 when the parties failed to reach consensus and the company withdrew from negotiations, saying commercial conditions had changed. Mr Jennings said this meant the Government had to negotiate a new deal with Hancock from which other interest groups were excluded. Hancock chief executive Linda Sewell said the "cores and links" agreement was not legally binding and the company gave six months' notice of its intention to walk away if a consensus could not be reached. Pulp wood and plantation legislation gives industry lease holders the right to remove native vegetation from Crown land. According to Ms Sewell, College Creek is a plantation established by Australian Paper for forest production in the 1970s. However, rainforest botanist Stephen Mueck believes it regenerated to become much more than a plantation. "There is still some surviving cool temperate rainforest and some threatened fauna," he said. Friends of the Earth campaigner Anthony Amis, also involved in negotiations with Hancock, believes the company needed to log the cores and links because blue gum and shining gum plantations in the Strzeleckis have failed. "Hancocks are logging under unsustainable contracts that can't possibly be met due to the failure of thousands of hectares of blue gum plantation," Mr Amis said. Letter to the Editor, The Age, 25 March 2009. IT WAS not surprising that Alan Ashbarry's letter (24/3) denying Australian forests are being ravaged by logging came from the same Tasmania that hosts the most intensive native forest logging in the OECD. Damage control down here consists mainly of reclassifying reality. A block of native forest that has been clear-felled, burnt, deep-ripped, herbicided, and resown with seeds of commercial eucalypts remains on the Tassie books as "native forest". A shining gum plantation is classified as "forest". As old-growth forest is steadily flattened, the consequent increase in the percentage of such forest listed as "reserved" is proudly trumpeted. If you want a true picture of what goes on down here, look out the plane window. And weep. This morning a group of 20 forest conservationists are preventing the clearfelling of one of the last stands of old growth forest in the upper Delegate River catchment in East Gippsland. Members of the group have prevented six logging machines from working using a complicated series of tripod structures, cables and a tree platform. Carmel Roberts - on site with trunk phone 03 9416 2129 - (dial tone) - 8384620 - on the hour. (The decision of DSE/VicForests to prioritise the placement of staff at protests is their decision. However we would hope they’d give precedence to keeping communities safe from fire if needed rather than to convenience a small number of logging operators. There are normally no more than three or four DSE/VicForests personnel allocated to protesters - police don’t fight fires). Every year we clear-fell 150 hectares of Melbourne's prime water catchment forest near the Thomson reservoir. We lose 20,000 megalitres of water (one full Maroondah dam) every year due to regrowth, which uses vastly more water than old growth. Clear-felling turns wet sclerophyll forest into dry sclerophyll forest and drastically increases the risk of fire. To save our water supply and reduce catchment fire risk we must stop clear-felling our water catchments, especially the Thomson.